What does it mean to dwell in an untouched comfort zone? It means never accomplishing beyond the easy items right around us. And that’s not a formula for success at anything. Not in business, not in church work, not in relationships, and not in life. 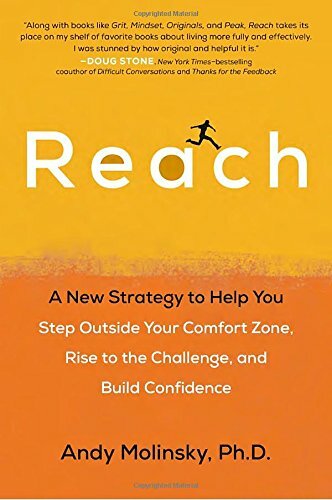 Into this discussion, let us drop Andy Molinsky (Ph.D., Harvard) and his book Reach. This is Molinsky’s second major book, after Global Dexterity, which looked at cross-cultural communication and work. The first couple of chapters are almost a waste, though I can understand their inclusion. Typically, it’s a safe assumption that someone reading about reaching out of their comfort zone understands the necessity of doing so and does not need a chapter to be convinced of it. Still, that’s not a major drawback. And it allows Molinsky to establish his basic vocabulary. From there, he presents a basic formula to overcome the fear of stepping out of comfort and into something new and challenging. That formula is built around three “C” words: conviction; customization; clarity. This concept works. The “Why” has to be the driving factor of making changes in life—that’s the “Conviction.” Every person is different, that’s “Customization.” Before you go from said to done, you need to know what to do, and that’s “Clarity." The work shines best after this formula, though, as Molinsky presents ideas for building resilience—for keeping up the work that you have chosen. This is the better part of the book. It is a healthy dose of get up and get your back into it, which is what many of us need. In all, I found Reach a good read. It challenged my thought processes and I think makes for a useful tool for personal development. It will also make a good read for businesses trying to take a step out of neutral into action. Worth your time, if you're willing to invest the effort in following through! I did receive a copy in exchange for the review.